Lorkhan, the Missing God, is the Creator-Trickster-Tester deity present in every Tamrielic mythic tradition. He is known as the Spirit of Nirn, the god of all mortals. His most popular name is the Elven variant Lorkhan, or Doom Drum, which sometimes appears as LKHAN. Names for versions or aspects of Lorkhan include Lorkhaj (the Moon Beast) in Elsweyr, Sep in Hammerfell, Sheor in High Rock, Shor in Skyrim, and Shezarr in Cyrodiil. He convinced or contrived the Original Spirits (et'Ada) to bring about the creation of the Mundus, upsetting the status quo—much like his (figurative) father Padomay is usually credited for introducing instability, and hence possibility for creation, into the undivided universe (or the Beginning Place). After the world materialized, myths hold that Lorkhan was killed, mutilated, or at least separated from his divine center, the Heart of Lorkhan (known as Sep's "hunger" to the Redguards and Shor's Heart to the Nords), in an event sometimes called the shattering of Lorkhan. This separation, which purportedly took place in Tamriel, is typically called a punishment, but stories often suggest Lorkhan submitted to it voluntarily. Whatever remained of Lorkhan afterward was exiled to wander through creation. As the impetus for creating the Mundus, Lorkhan is at the center of the great ideological schism between the Elven and human perspectives on the event, which is known as the Sundering to Elves, and thus opinions of him vary dramatically in Tamriel. The Theory of the Lunar Lorkhan states that the twin moons Masser and Secunda are Lorkhan's "Flesh-Divinity"—his literal corpse. It says that, like the Aedra, he was a planet (or plane) that participated in creation, but his planet split and his divine spark fell to Nirn "to impregnate it with the measure of its existence and a reasonable amount of selfishness". 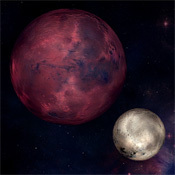 The moons thus represent the "Cloven Duality", or dichotomy of opposites, that is central to the Tamrielic dialogue on Lorkhan. Everyone eventually assigns a motivation to Lorkhan and picks a favorite story to believe, but the truth is as elusive as Lorkhan himself. He is associated with trickery regardless. In legends, he is almost always an enemy of the ancient Elves and, therefore, a hero of early Mankind. Some Nordic myths state he vowed the Dwemer would "die by [his] hand" shortly before their disappearance at the climax of the War of the First Council around 1E 700. One even claims that he was briefly reunited with his Heart and mortally wounded Nerevar before being defeated again. To the Altmer, Lorkhan (who they view as more a limit than a nature) is the most unholy of all higher powers, as they believe he forever broke their connection to the spirit plane. That their stories say Trinimac defeated Lorkhan and tore out his Heart is little consolation, and they still believe sadness is "the best response to the Sundering". Their wish is to return to the spirit realm, but Lorkhan is the demon that hinders their way; to them Nirn is a prison, an illusion to escape. Others, while accepting that Nirn is a cruel place full of mental anguish, think that Lorkhan created the world as the testing ground for transcendence; to them the spirit realm was already a prison, and true escape is now finally possible. Legend holds that at Convention, Auri-El slew Lorkhan at the apex of the Adamantine Tower. When the Doom Drum's Heart proved indestructible, Auri-El attached it to an arrow and launched it across the world. As it passed over the Heartlands of Cyrodiil, Lorkhan's crystallized blood fell to the ground, and the Ayleids found and used it to fashion the Chim-el Adabal. The Heart fell to the ground in modern-day Morrowind, forming a volcano, Red Mountain. The Dwemer eventually found and tried to exploit it, leading to the disappearance of their race from the face of Nirn. According to Orc and Chimer creation myths, Boethiah took exception to the lies being spread by the Elven gods about Lorkhan, most especially those espoused by Trinimac. He defeated Trinimac and took on his form to spread "the truth of Lorkhan's test", the Tri-Angled Truth, and persuaded the followers of Boethiah and Trinimac to abandon Altmeri society. Boethiah and Mephala showed them the rules of Psijic Endeavor, a process championed by Saint Veloth and Vivec by which mortals may equal or surpass the gods that created them (the stated purpose of the Mundus), which may be the "truth of Lorkhan's test" referred to in legend. He is still associated with the Psijic Endeavor in Morrowind. Lorkhan has obscure relationships with other deities. He and Akatosh are the only deities who seem to be present in every tradition. Some legends say that Kynareth was the first to agree to his idea for a mortal realm. Mara is sometimes considered his wife or concubine, as is Kynareth (or Kyne). Sheogorath is said to have been created when Lorkhan's divine spark was removed from the world. While Lorkhan is the god of all mortals, Arkay is known as the Mortals' God. Lorkhan is sometimes associated with Sithis, "the Void", who is worshipped by members of the Dark Brotherhood. Mythic 'echoes' of Lorkhan's presence take the form of diverse avatars, incarnations, and historical patterns personified by the Shezarrines, powerful and mysterious heroes believed to have some connection to Lorkhan and each other. Cults devoted to Lorkhan (or his aspects) have long existed in Tamriel. One cult may have predicted the rise of Tiber Septim. These cults proliferated in the late Third Era, and they are associated with spreading the understanding of the Dragon Break phenomenon (though their work is looked down upon in some scholarly circles). Mankar Camoran claimed that Lorkhan is a Daedra whose Daedric plane is "Dawn's Beauty ... misnamed Tamriel by deluded mortals". The Altmer view of Lorkhan is the most well-known among the merish cultures and is often mistaken to be the shared impression of Lorkhan among all mer. The Altmer, believing they were directly descended from the Et'Ada and perhaps are trapped Et'Ada themselves, believe that Lorkhan tricked the Eight into creating the world, thereby trapping the Eight and the inhabitants of this new Mundus into mortal flesh. Within Altmer legend, Lorkhan is a staunch adversarial figure, viewed as the bringer and blame of all their metaphysical woes. The Dunmer share a particular, near-intrinsic relationship with Lorkhan. In Dunmeri legend, it is said that Boethiah's 'creation' of the Chimer was acted out with Lorkhan in mind, stating that the Chimer were to pledge themselves to the 'Frame-Maker', Lorkhan. 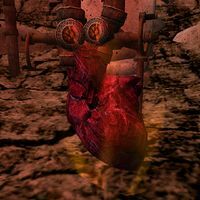 Lorkhan's Heart would later become the source of the Tribunal's divinity, with Lorkhan and his motivations becoming a pondered topic in Vivec's own 36 Lessons. The scarab, the symbol for Lorkhan shared by the Dunmer and the Dwemer, is a constant within the daily life of the Dunmer, depicted on a plethora of common household objects and being utilized as both the symbols of House Redoran and in part House Dagoth. The Dunmer consider existence within Lorkhan's creation to be a challenge designed to temper their spiritual endurance and willpower with the purpose of mortals transcending the gods who created them. Lorkhan is the only god in the Dunmer pantheon who is not once-mortal or a Daedric Prince. Known to the Redguards as Sep, Lorkhan is viewed as an adversary in Forebear and Crown religions alike. In Redguard legend, Sep was driven mad by the Hunger of Satakal, and convinced the other gods to create a 'shortcut' to the Walkabout, resulting in the creation of the mortal world. Though punished for his actions by Tall Papa, Sep continues to exist as a shadow of his former self, attempting to prevent mortal souls from reaching the Far Shores after death. Bosmer, like the Altmer, regard Lorkhan as a trickster god who convinced the other gods to help him create the mortal world. However, within Bosmer culture, Lorkhan's actions paint him in a far more positive light than in Altmer culture, as Bosmer culturally are fond of trickster gods. Lorkhan is regarded to be clever for his actions, and his cunning an aspiration. There have been known Lorkhan cults found in Valenwood. Known as Lorkhaj, the Khajiit view of Lorkhan closely resembles that of the Altmer. In Khajiit legend, Lorkhaj, the Moon Beast, created the mortal world through tricking the other gods into aiding him. He was slain for his crime, and removed from his Heart, though was later forgiven for his trickery by the mortal world, Nirni (Nirn), who was 'able to make children' and was grateful for it. Lorkhan was the last of the litter of Fadomai, and held within his Heart a Great Darkness that would become Namiira. To the Bretons, Lorkhan is known as Sheor, or the "Bad Man". Within Bretic religion, Lorkhan is the representation of all struggle and strife that can be encountered in the mortal world. In particular, he is associated with crop failure. Worship of Lorkhan in Cyrodiil is steeped within politics. Known as Shezarr in the Nibenese East and Shor in the Colovian West, Lorkhan in Cyrodilic culture is a diplomatic god, "the spirit behind all human undertaking". The creation and presentation of Shezarr was carefully crafted by Saint Alessia, born from a synthesis of Nordic and Aldmeri pantheons that would later become the Eight Divines and the basis for Imperial religion as a whole. The inclusion of Shezarr satisfied the Colovians who were culturally and religiously Nordic, but gentled to make him more appealing to Alessia's own subjects, who until then had adhered to the Altmeri view of Lorkhan as an adversarial and evil god. Shor, as he is known in Skyrim, is the Nordic god of the Underworld and is a prominent ruler of the Nordic pantheon, with Kyne being his female equal and wife. Unlike the Dunmer and their quiet but thorough integration of the god into their lives, the Nords are open and bold in their worship of Shor, with his epitaphs commonly used in conversational exclamations. Shor is known as the creator of Sovngarde, the Nordic afterlife, where great warriors of the Nords would be welcomed after their honorable death to feast and fight with the great warriors who passed before and with Shor himself. This page was last modified on 16 February 2019, at 16:53.